Disclosure: I received a basket for feature from Betty Crocker. All opinions are my own. This is the first year we are actually in Christmas cookie baking mode. Kids love anything on a stick so the Christmas Tree Cookie Pops from the Betty Crocker™ Holiday Recipe Booklet 2014 was up first. The Betty Crocker Sugar Cookie Mix makes baking beyond quick and easy. With just a few additions like cookie cutters, sprinkles and lollipop sticks, Kenzie was ready to get her bake on. Kenzie enjoyed mixing the dough, rolling it out and cutting out the shapes. We colored the vanilla frosting with gel and she learned how to spread it over the cookie with a plastic knife. The sugar sprinkles were the best part of decorating. This was the first time actually making cutout cookies with the Betty Crocker cookie mix and I was surprised at how delicious and chewy these were. They were in the oven for 10 minutes and cooled for about 30 minutes. Perfect and will definitely be making more to share! Check out the helpful online Kid's Cookie Corner featuring Betty Crocker's Top 10 cookies for kids and short, inspirational/how-to videos on each! 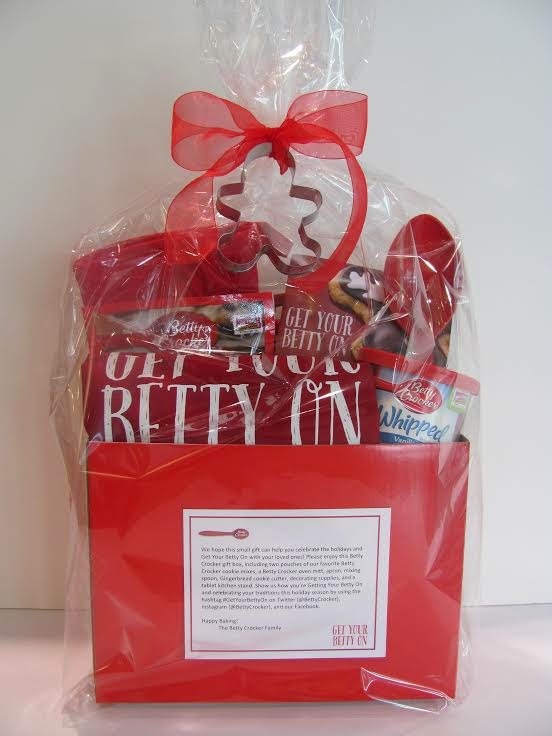 One winner will Receive a Betty Crocker Baking Basket*! I love the cookie pops. My teen and tween are my baking partners. I just made sugar cookies with my mom while home for Christmas! My favorite are Chocolate-Cherry Snowballs and my baking partner is my sweetheart Scott. My baking partner is my daughter and I love the Buckeye Delights! My baking partner is me lol... I don't really have one. Hubs don't care to help and my kiddos are still too young to help me. I love the Chocolate Chip Christmas Cookies! Sugar cookies are our favorite, my baking partner is my 14 year old and the 3 year old. lol, I went to the store! Wrong thing to do o Christmas eve, but I really wanted to fix some of BC eggnog cookies.... well of course they were out. So I got oe of my favorites! Macadmia nut and White Chips, YUM! As for cooking partner not so much. Plenty of eating partners though! My favorites are the Chocolate Chip Reindeer Cookies and my partner is my neighbor tween. My wife and I like to bake the Chocolate Chip Reindeer Cookies. The Giant Holiday Cookie Tree Stacks are my favorite - and my baking partner is my husband! I like the Chocolate Chip Christmas Cookies and my baking partner is my daughter. I bake with Alysia (she is 6 years old) and we like Chocolate Chip cookies best. Chocolate chip cookies are my favorite and my baking partner is my daughter! I love Snickerdoodles! My son has food allergies, but when I am certain of all ingredients, he is my baking partner. Classic Spritz Cookies and my daughter. I love making rolled and cut sugar cookies and decorating iwth tons of colored frosting and all the grandkids. Oh I love to bake with my kids and we enjoy making all kinds of cookies! The Chocolate Chip Reindeer ones look cute! I'd like to try the Melting Snowman Cookies and my baking partner is my dd! I love the Sugar Cookie Snowmen. I bought a cookbook for my granddaughter and this recipe is in it. We picked it out to make over the holiday. My baking partners are my grandchildren. My favorite are oatmeal scotchies, but that is primarily so I can eat handfuls of butterscotch chips while we make them. We usually make them together as a family. Hello! It's hard to choose one. lol I think my favorite is the Holiday Blossom Cookies. I don't have a baking partner. It's just me. Thanks!! My son and my mother are my baking partners. My favorite cookies are ginger bread men. My favorite are the chocolate chip cookies. My baking partner is my son. My favorite are Five-Star Chocolate Chip Cookie Recipe and my daughter is my partner! I love their Melting Snowmen cookies. My baking partner lately have been my niece and nephew. My favorite is Chocolate chip cookies and I bake with my daughter. The Melting Snowman Cookies are my favorite. I enjoy baking with my daughter. I love white chocolate macadamia nut cookies! My toddler daughter is my baking partner. We made Christmas Tree sugar cookies together for the first time this year. I like the Melting Snowman Cookies and my baking partner is my 4 year old granddaughter. I love the Melting Snowman cookies. We made them this year and they were a great hit! I bake with everyone during the holidays: family friends, my nieces and even my dad. I love the melting snowmen cookies and my partner is my daughter Rylee. I like the Melting Snowman Cookies and my baking partner is .... my dog! She waits to see if I drop anything on the floor. The Chocolate reindeer are really cute! My son is my baking partner when he wants to. My baking partner is my son and I love making Chocolate Chip cookies! I enjoy baking molasses cookies and cut out sugar cookies with my mom, sister, son and nieces and nephews. We have so much fun decorating them. My favorite are the Soft and Chewy Chocolate Chip Cookies -- my baking partner is my granddaughter. My son is my baking partner and I think we'd have fun making the Sugar Cookie Snowmen together! My baking partner is my 7 year old son! We love to make Chocolate chip and the giant christmas tree cookie! I like the chocolate chip Christmas cookies and my cousin is my baking partner. I'm looking forward to making the Holiday Tree Cookie Stacks with Hunny. I like the sugar cookie snowmen. My baking partner would be my granddaughter. My baking partner is my niece. I love the chocolate chip reindeer cookies. I like snickerdoodles cookies and my baking partner is my 4 year old grandson! i love the Holiday Ornament Cookies. my baking partner is my 8 year daughter. she loves baking. My favorite is the Giant Christmas Tree Cookie, how cool! My baker-in-training is my daughter. I like the Elf and Friends Gingerbread Cookies. I like to bake with our daughter. We love to bake sugar cookies with sprinkles. I make them with my nieces. They love to cook. I love just plain chocolate chip cookies. My oldest son is my baking partner! My favorite are the sugar cookies and my daughter is my baking partner! I love Peanut Blossoms and my favorite baking partner is my niece. Sugar Cookie Snowmen; my kids! My baking partner is my mom, and we like chocolate chip! My baking partners are our girls, my tasters are our boys, I like the Cookie Wreaths. The Holiday Tree Cookie Stacks sure are cute! My kids help with the cookies around the holidays. Yay for cookies! I'd like to make the Chocolate Chip Christmas Cookies recipe. My cats love to "help" in the kitchen! I like the chocolate chip Christmas cookies. My baking partner is my granddaughter. My favorite is the Soft and Chewy Chocolate Chip Cookies. Everyone loves chocolate chip cookies in this house and they never last very long. My absolute best cooking partner is my daughter. I love the Melting Snowman Cookies, my son would get such a kick out of them! I love Snickerdoodles! The Holiday Blossom Cookies sound great too! I like baking with my niece since my daughter is too young to help out much yet! My favorite is the chocolate chip reindeer cookies and my baking partner is my daughter. My kids are my cooking companions! And I love the Betty Crocker Hershey's Chocolate Premium Cupcake Mix! Yummo! My cooking partner is my niece. She loves baking cookies. the chocolate cherry snowballs look so good. My favorite baking partner is my mother. We love making chocolate chip cookies with reese's pieces. I like to make chocolate chip cookies with my mom. I like the holiday blossom cookies and my cooking partner is my best friend, Jo. I love Chocolate Chip Cookies. I want to try the Ultimate Chocolate Chip Cookie recipe. I like to bake with my son and daughter but my husband is my favorite baking partner. Chocolate chips are my favorite and can't wait for my grandchild to be my partner. My grandsons are my baking partners and their favorites are sugar cookies. Mt favorite cookies are the chocolate chip cookie recipes. My sometime baking partner is my 6 year old grandson. My favorites are the Chocolate Chip Reindeer Cookies and my partner is my daughter. I like the five star chocolate chip cookies and my baking partner is my 8 yr old nephew. He loves to create goodies. I like the Chocolate Chip Christmas Cookies and my baking partner is my younger daughter. I love the Ginger Elf Christmas Cookies. I love to make cookies with my kids. I made the mistake by getting the ginger bread men kit where the cookies are already made and the kids just decorate. Those cookies were HORRBLE tasting, and I vowed never to do that again!!!. My grandson is my baking partner and we like the Melting Snowman Cookies. Sugar cookies are my favorite and my baking partner is my daughter. The DIY Christmas Tree looks like a fun project for me and my granddaughter. I like the 5 Star Chocolate Chip Cookie. My baking buddy is my grandson. I love the Santa Hat Cookies. They are so cute! My favorite cooking buddies are my mom and sister. I like the holiday blossom cookies. My little grandson and I like to bake together. Sugar cookies are our favorite and my fiancée and daughter are my cooking partners! My favorite are soft peanut butter cookies or oatmeal raisins. My baking partners are my nieces. I love chocolate chips with walnuts. I especially enjoy baking with my son. The chocolate chip are definately my favorite and my sister & I love baking together! The Chocolate Chip Reindeer is my cookie of choice; Josie would be my partner. My favorite is the Whole Wheat Chocolate Chip Cookies and my baking partner is my daughter. Santa hat cookies. My mom made the ones right below them with sugar and kisses. They were good, and adorable. Our favorite are plain ol chocolate chip cookies!!! My baking partner are my boys!!! Easy Snowman cookies will be a big hit. My daughter loves the winter scenes. She is my partner. The oatmeal chocolate chip cookie is our favorite. My 11 yr old is my favorite baking partner. Chocolate chip is my favorite and my kids love baking with me! My BFF is my baking partner. We love the chocolate chip cookies! My husband is my baking partner. I like the Holiday Blossom Cookies. My kids are my baking partners...I like the Linzer Star Christmas Cookies. My favorite cookies are the Elf and Friends Gingerbread Cookies. My baking partner is my daughter who love to help me back cookies. My favorite cookie is chocolate chip and my sons are my baking partners. I like the Snickerdoodle Cookie Mix, and I bake alone. My favorite is the Hot Chocolate Cookie recipe. My baking partner is my grandson. I love the Holiday Drop Cookies, and my favorite baking partner is my 9 year old! I like the Holiday Blossom Cookies. My baking buddy is actually my husband. I really like sugar cookies because they are so versatile. I usually cook alone now. I like the Soft and Chewy Chocolate Chip Cookies recipe and I love baking with my kids. My son is my baking partner and we love all cookies!! My favorite is sugar cookies. I do them every Christmas with my grandkids now that my kids are grown. I love the reindeer cookies and my baking partner is my 3 yr old daughter! Chocolate chip cookies are my favorite, and our daughter is my baking partner. Chocolate chip cookies are my all time favorite! My baking partners are Zach, Gavin and Caleb. My favorite is the classic chocolate chip cookie recipe and my baking partner is my husband. I would make the Christmas cookie pops with my daughter. I printed the Almond Streusel-Cherry Cheesecake Bars! Elizabeth miller---we love sugar cookies!!! I also love to bake with my 9 year old daughter. I like the Limited Edition Salted Carmel Cookies and my baking partner is my mom! My favorite cookies are oatmeal raisins and my cooking partner is my sister. I love Snickerdoodles - Betty Crocker has some awesome looking variations! My 2 youngest sons are my baking buddies. Sugar cookies with my niece and nephew! I like Stained Glass Christmas Cookies and my Daughter is my baking partner. The Chocolate Chip Christmas Cookies look good. My son is the baker in the family so I am his helper. Sugar Cookies, and I cook with my neighbor April. The Chocolate Chip Reindeer Cookies are my favorite. Our daughter would be our baking partner. My favorites this year were peanut butter cookies made in a mini muffin pan with a reeses pressed in the center =) My hubby is usually my baking partner! I love the Blossom cookies. My favorite baking partner is my teen daughter. She sometimes makes the process take longer with her antics, but these are memories we will cherish. My favorite cookies are Sugar cookies, just plain Sugar cookies...love them and my baking partner is my daughter, my grandson and my granddaughters. Chocolate chip cookies are my favorite and I don't have a baking partner. I made the Betty Crocker sugar cookies for the holidays, with my granddaughter and they were fun to make and very good. Thanks! My favorite cookies are pumpkin and I tend to bake by myself. I love the Christmas Cookie Pops! My baking partner is my friend.